For the most recent Saving Our Stars' newsletter, click here. Thank you for your interest in dark skies and fighting light pollution! For the following, please click the link. Choose amber colored light, which will have less green and blue light (white light has more blue). We want to minimize blue light emissions, as blue light scatters in the atmosphere. It's also best to minimize green emissions. 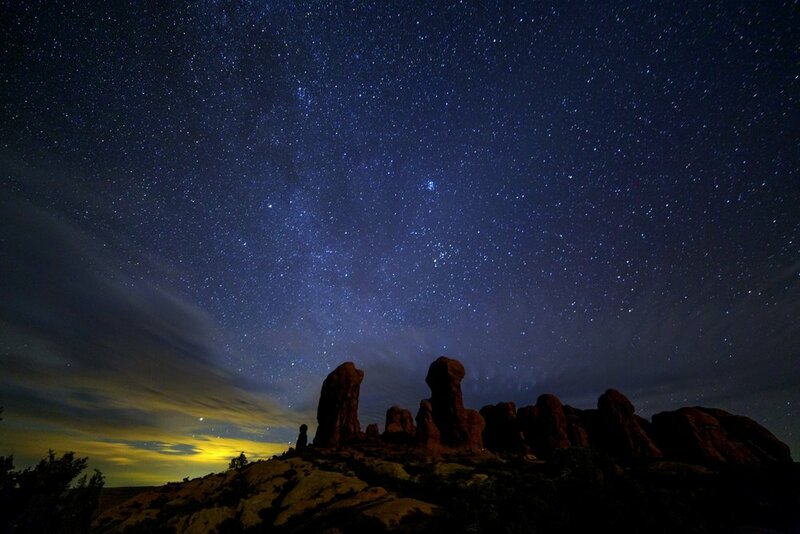 Please see Flagstaff Dark Skies Coalition's explanation for why color is so important! For outside lighting, choose amber LEDs. yellow CFLs or incandescent, including Halogen. I focus on the color amber, because most people will be using LEDs, and with LEDs, amber is our best choice, as yellow LEDs are often warm white, and we want to avoid warm white. If you must choose a warm white LED, choose a Correlated Color Temperature (CCT) of 2700 Kelvin or less (the lower the number, the better, as there is less white/blue light), and be sure to choose a low wattage. Note that 2700K still has a lot of harmful blue light. 2200K or less is preferred, but Amber LEDs are best. We want light to shine down and not to the sides or up to the sky. Try to avoid fixtures with glass or materials below the lightbulb, even if they are considered dark-sky friendly, as these can get dirty, attract spider webs, etc., which can all cause light to reflect (thank you for teaching me this Christopher Kyba). It's especially important that white LEDs (rich in blue light) be reduced in lumen output to less than 50%. Blue light is seen so well by the human eye that a reduction in brightness is normally not even noticed. Only use the amount of light needed, because with lighting, "less is more." When too much is used, it creates glare, harsh shadows and can actually make it harder to see, all of which makes us less safe. See this great article titled Light Pollution Endangers Our Security and Our Safety. LIGHTS ONLY ON WHERE OR WHEN NECESSARY. Use timers, motion detector lights, or simply turn off unnecessary light. Keep your blinds and shades closed to keep indoor light from spreading outdoors. Now that you've gone over the basics of dark-sky lighting, you can explore further with the fabulous resources, articles, etc. offered by the below dark-sky organizations, and be sure to google for astronomy or dark-sky lighting organizations in your local area and state. Light pollution maps, such as Dark Site Finder, Light Pollution Map, and The New World Atlas of Artificial Sky Brightness, are great resources for determining the levels of light pollution across the globe. There is also a Dark Sky Finder app. For places under dark-skies using dark-sky lighting, find an International Dark Sky Place near you. You can also check bortle scales. For example, if you're in Texas, checking the bortle scale of Texas parks will show you their light pollution levels. Be sure to visit the How to Help page for resources on fighting the installation of white LED streetlights, sample letters for contacting your city officials, signing light pollution petitions, outreach photos, creating a lighting ordinance in your town, learning how your town or neighborhood could become dark sky certified, and more!